If instead you want some detail, read on. Berlin – long the testing groud for car sharing schemes – has a new mobility craze. The eScooter sharing scheme. Coup‘s grey and green scooters, and Emmy‘s red ones, are a familiar sight in central Berlin (the schemes operate within the Ringbahn, the traditional delimiter of inner and outer Berlin), and you catch the faint electric motor whirr sound as a scooter speeds off ahead of the cars at traffic lights. The scooters are GPS equipped, meaning they can be picked up and left anywhere – you do not have to return them to the same spot. Batteries are removed and recharged by the operator companies, so no need to worry about that. But what are these schemes like to use? And which works best? That’s what I set out to test, and this blog is the result of those tests. I signed up for both schemes on 30th August 2017, and the test trips were made on 1st September 2017. Procedures may subsequently change. My tests were using the iOS apps for both schemes, but Android apps are also available, and the apps are not restricted to German app stores – they are internationally available (thanks @BrusselsGeek and my sister for testing that for me). Scooters in both schemes can be driven if you have a regular car driving license, and the scooters have a maximum speed of 50km/h as a result – they’re legally treated in the same way as a 50cc petrol scooter would be. You need a driving license that allows you to drive category AM (this is normal on a European car driving license that also allows category B – cars). Only Emmy can be used if you do not have a credit card (see more in Signup below for more on this). I downloaded both apps on my iPhone 6S (Coup | Emmy) and signed up within the app. The first impression is that the Coup app is much more polished and better thought through than the Emmy app (although – as will become clear later – Coup’s lacks a core function, post sign-up). The entire signup for Coup is conducted within the app. You need to give standard details like name, address, date of birth and – importantly – have to take a photo of your driving license and ID or passport, and take a picture of yourself using a special frame (to assess whether you are the person stated on your license). You also have to put in credit card details – that is the only way to pay for Coup. There is no signup charge, and no monthly fee, but no free riding either. Confirmation of signup is not automatic – it takes a few minutes (about 5 in my case) and the notification it has been successful appears in the app. When this is done you’re ready to drive. Overall Coup‘s signup procedure is extremely smooth, simple and well designed. In the Emmy app the signup is conducted through what looks like a form in a web browser. The required information is similar – name, address, date of birth. On payment things are a little different – a credit card can be used, but payment is also possible with Lastschrift (standing order) from a bank account in Germany. Also at the start you have to pay €10, and for that you get 100 minutes of use included (more on pricing of both schemes below). The bigger challenge with the Emmy app is with the driving license approval (no pic of ID or passport is needed here). Instead of a picture you need to film yourself moving the driving license so as to show the holograms on it, and to film yourself holding your driving license next to your face. This is more messy than Coup‘s system, and mine failed – my signup did not immediately get processed, and the error telling me this was so only appeared on the map screen in the Emmy app, meaning I did not immediately understand what was going on. The second submission worked out, and I was then ready to drive. Some of the email confirmations from Emmy arrived in German as well – this was a little odd as I was signing up in English. One further note: Coup handles basically everything in the app, Emmy sends email notifications confirming everything. It’s a matter of taste as to which of these is better. On signup: Coup is excellent, Emmy is not bad. This is where the differences between the two schemes really start to show up. First Coup, that has the simpler pricing model. When you reserve a scooter in the app you get 15 minutes of time free to get yourself from where you are to the scooter. Once you activate the reservation (more on that below) you then get 3 minutes to get yourself together, get the helmet on etc., before starting your ride. When you do start the ride there’s a flat fee of €3 for up to 30 minutes of riding, and then €1 for every 10 minutes after that. There’s a day rate of €20 (between 7am and 7pm), and a night rate of €10 (between 7pm and 7am) – price list here. Emmy also gives you 15 minutes for free to find your scooter, but the costs start accruing from the moment you confirm the registration. It costs €0.05 per minute with the ignition off, and €0.19 per minute with it on. Or you can be billed by kilometre – at €0.59 per started kilometer. You will be billed whatever costs you less. And as a start you have 100 minutes included when you first sign up. This will mean that for short trips Emmy will be cheaper, but you are better going to predict your costs with Coup. Coup‘s scooters are Taiwanese manufactured Gogoro Series 1 machines, and there is only one design. While the scooter itself allows speeds of up to 95km/h (according to Gogoro’s site), the maximum operating speed in Berlin (for legal reasons) is supposed to be 45km/h. In my tests I could regularly get the scooter going 52km/h on the flat. The supposed distance available on a full charge is 100km. The extraordinary thing with the Gogoro scooter is its acceleration – you can pace away effortlessly at traffic lights. The scooter also has regenerative breaking – it doesn’t free wheel, but slows down if you do not keep the throttle on. The ride is very smooth and the design similar to that of a Piaggio scooter – you ride with feet on the platform of the scooter. The indicators make a nice chunky thud-thud noise to remind you they are on. The foot stand is also simple and light to use. The only design downside I could find is I found the mirrors hard to get right – they were too low and narrow for my liking, meaning I could not avoid seeing too much of my arms. In total there are 1000 scooters available in Berlin. Coup has been financed by Bosch, but as far as I can tell it’s a financial and not an engineering interest from the German firm. Emmy offers four different types of scooters, among which the Torrot Muvi (manufacturer’s page about it here) is the most common in Berlin – and it was this model I used on my test runs. The Muvi is also supposed to have a 45km/h maximum speed, and in tests I regularly reached 49km/h. The advertised distance available on a full charge is 85km. The Muvi has a more narrow, slightly retro look to it, and you sit more astride it than on the Gogoro. It’s not a sluggish machine, but it is noticably less snappy than the Gogoro. The indicators are silent, meaning you can sometimes forget they are on. The mirrors are excellent and easy to adjust. The kick stand is heavier to operate than on the Gogoro. Emmy’s other scooters – the cult, retro chic and classic – are listed here. You know which type of scooter you will get when you reserve it in the app. 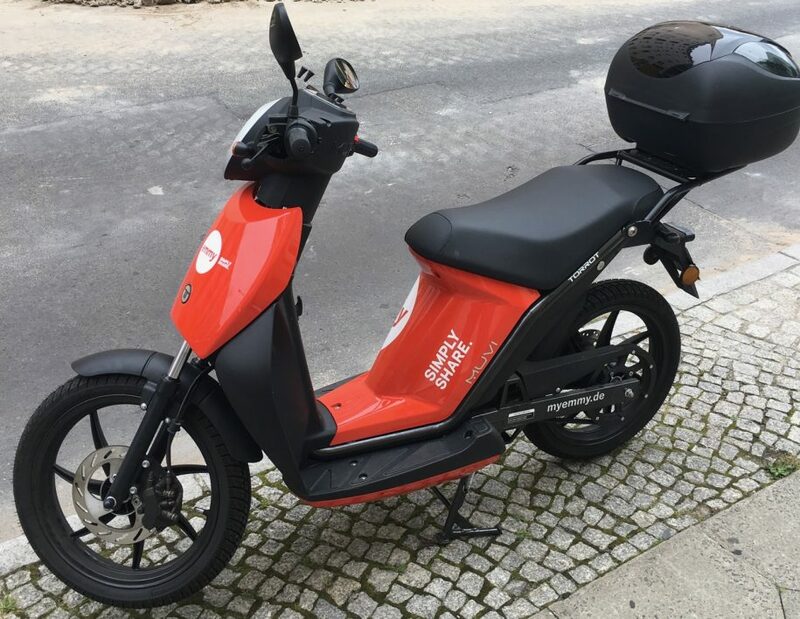 Emmy will have 750 scooters in Berlin by the end of the year. In both cases when you get to within a few metres of the scooter you can activate and unlock it using the buttons in the apps. These connect to the scooter with Bluetooth, and worked flawlessly every time I used either scheme. In this category it is a clear win for Coup though – its scooters are better in almost all regards. Coup scooters have one helmet under the seat. 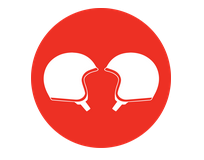 The space vacated by the helmet is enough to store a small bag. The helmet itself fitted me well – and I have a reasonably large head. There is a kind of hygiene net you can use if you do not fancy using a helmet someone else had been wearing. Emmy scooters have 2 helmets – in the luggage box at the back of the scooter. One helmet is extra large, the other small. The large one was more uncomfortable on the ears than the Coup helmet, but having two helmets is handy – it means you can take a passenger (providing one of you has a small head, and one a large head). Here Emmy wins – having two helmets is a better bet I think, even if that means a rather large luggage box for them! I needed to make 4 rides on the test day. Firstly from my home in Bergmannkiez (Kreuzberg) to a conference at Kosmos (Friedrichshain) – roughly 7km. Then from Kosmos to a lunch appointment in Kollwitzkiez (Prenzlauer Berg) – roughly 4km. And trips 3 and 4 were the reverse – back to Kosmos, and then back home. I looked at both the Emmy and Coup apps at about 0920, needing to get to Kosmos by 1000. An Emmy was available about 500 metres from my home, at 102-103 Bergmannstrasse. So I swiftly walked over there… to find nothing. The GPS spot in the app for the scooter was set back a little from the road, so I hunted around in the two yards near the DM store there, and the parking lot behind it. Nothing. I went into the side street and checked yards there. Still nothing. Wherever this scooter was, it most definitely was not anywhere I could find it. Emmy “Petra” – not to be found! The next option? A Coup, a further 700m away, near the old Schultheiss Brauerei. This time the scooter was there – but damaged, with scratches on the rear of it. Nothing to stop the scooter being usable, but something that you have to report in these share schemes. So I had to call Coup to check that the damage had been registered (it had) and hence I was OK to continue. One aspect I subsequently discovered in Emmy‘s app is the damage to a scooter is listed there – that’s not offered in Coup’s app. Anyway by this time I had spent more than half an hour walking, searching and reporting. The eventual trip for the 7km took me 26 minutes – making the €3 charge for Coup seem good value. Emmy would have been €4.13 on Emmy’s km charge. Scratched Coup. And the booking completion screen. The next trip was rather simpler – an Emmy from Kosmos to Kollwitzkiez. The Emmy Muvi confused me at first, as you had to have it off the stand before it felt the machine was on, but once I had overcome this it was straighforward. In comparison the Coup app is much better with its graphics explaining what a user has to do to active a scooter’s functions. The only slight annoyance here was the walk – 700m from Kosmos. It seems no-one in the Plattenbau area around Karl-Marx-Allée is using these schemes! The 4km trip took just under 14 minutes, making it €2.36 on Emmy’s kilometre charge. A Coup would have been €3. The trip back to Kosmos was a Coup, with no damage this time, but with a walk of 730m to get the scooter. The quick route along Danziger Strasse took 11 minutes for the 4km and cost €3. An Emmy would have cost €2.09. The final trip of the day was back to Kreuzberg. 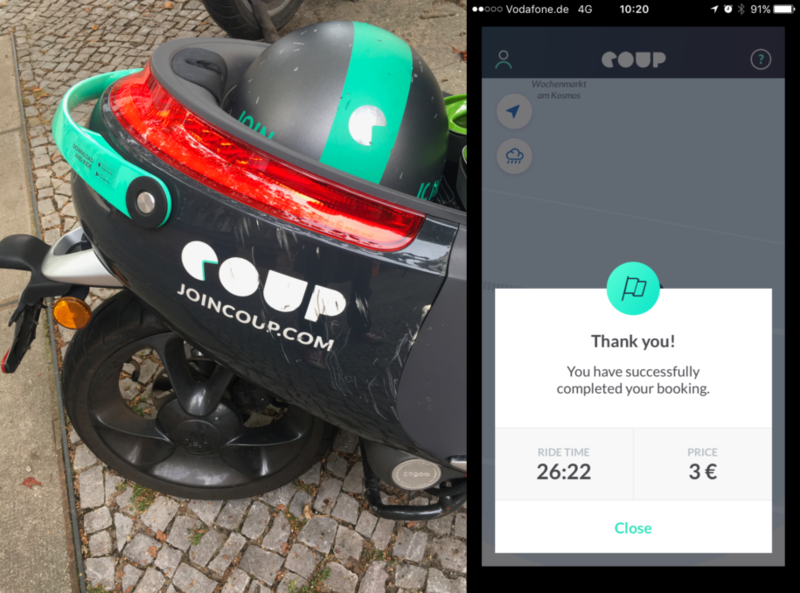 Initially the Coup app had shown a scooter right at the venue (where I’d left one from my earlier trip), and I reserved it. But somehow when I got there it was gone. There is no way to manually refesh the app it seems – you can by quitting it and re-loading it, but with the turnover of these scooters being so high that’s not an ideal solution. Anyway with the Coup gone, I resorted to an Emmy back to Kreuzberg, having walked 400m to find it. The 7km took 22 minutes, and would have been €4.18 on Emmy’s kilometre charge. A Coup would have been €3. Average distance walked to find scooters: 582m. Coup is also available in Paris, while Emmy is also available in Hamburg, München, Düsseldorf, Stuttgart and Mannheim. 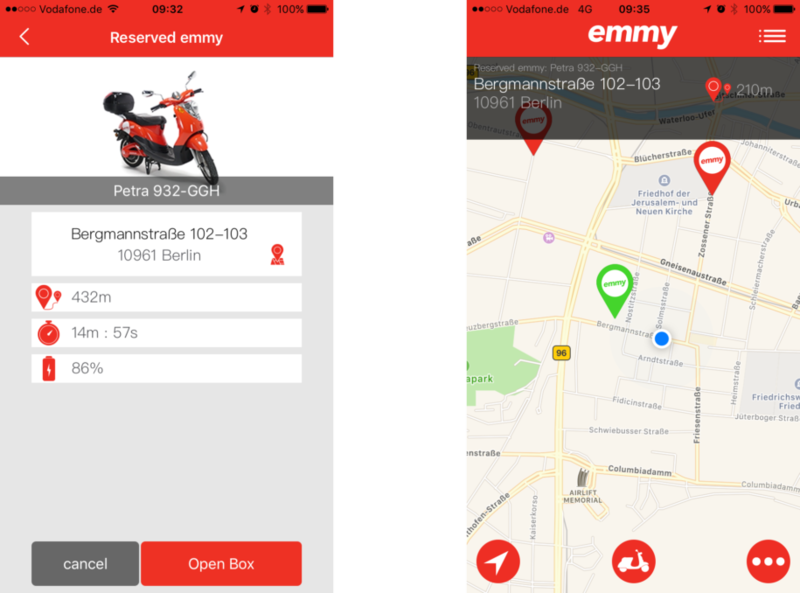 Brussels and Antwerp has a scheme called Scooty that uses the same looking app as Emmy, but annoyingly requires a separate subscription. 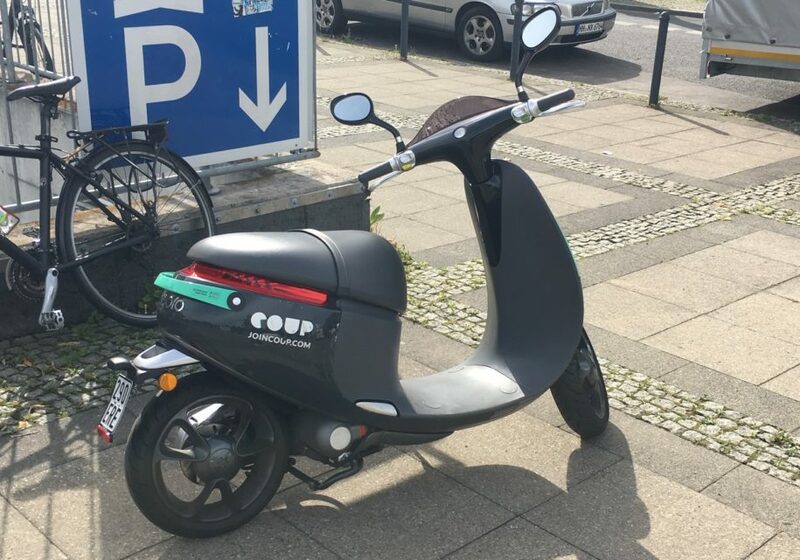 Even though these scooters do almost 50km/h, and – especially with Coup – the acceleration is impressive, I was struck by how damned fast a lot of Berlin traffic is, even on roads with a 50km/h speed limit. Yes, you’re faster than a bicycle on one of these, but you’re not the fastest on the road. The scooters are so quiet you do sometimes need to use the horn to warn people you are there! So there you have it. Pros and cons for each. As neither of these firms demands a monthly fee, and Coup has a free sign up and Emmy just €10, if you’re going to try this have done with it and join both. As for the question of how often I’ll use these scooters – time will tell. Do also let me know your thoughts and corrections in the comments! Very useful reviews! Thank you! I started using Coup at the beginning of the summer and loved it right away. I still love it — when it works. But my recent experience is that 1/2 to 2/3 of the time, something goes awry. I get the feeling that the organization is suffering from some combination of poorly managed growth and budget constraints. Here was my experience today. Around 1430, I checked for a scooter and was told to upgrade the app. (I had high hopes, but . . . .) I reserved a scooter that was near my house. Or rather, I tried to. The app blinked and then simply showed the map: no indication scooter was reserved, no possibility to try again. I closed and reopened the app. Now, the nearby scooter didn’t show on the map. I tried to reserve a more distant one, but the app just got hung up. (Kind of a pinwheel of death effect.) I closed and reopened again — and now the initial, nearby, scooter was shown as reserved! Got to the scooter, opened the trunk . . . no helmet! I checked the scooter back in (no charge, thank god). Reserve another, that is about 700m away. While I’m walking there, I call support and tell them I just had a scooter with no helmet. The dude says, “Well, maybe you should try another one.” Um, yeah, got that. But don’t you want to know the number of the helmet-less one, so you can take it out of service? Get to the next scooter and . . . the helmet doesn’t have a buckle on the strap. At this point I’m getting late for an appointment, so I drove with the helmet unbuckled. Oh, by the way, there were no hygiene caps available, but that’s almost always the case. Finish my meeting, find and reserve a scooter about 650m away. Arrive, press to unlock the scooter . . .and nothing happens. Scooter won’t respond. App won’t respond. I close and reopen the app and select another scooter farther down the street. That one — are you sitting down? — has a helmet with a buckle and a hygiene cap (one, so none for the next renter). Drive home and end the rent without drama. Finally: I just checked for nearby scooters for a dinner date. The app (the just upgraded app, remember?) connects my location to a scooter that is over 2km away! There are 10+ scooters closer to me; the closest is two blocks away.